Although Concordia offers a variety of science majors in fields of study like biology, chemistry, physics and engineering, the university does not offer a pre-medical program. For students not currently attending preparatory years of study for medical school at universities like McGill or the Université de Montréal, the field of medicine can be hard to navigate. 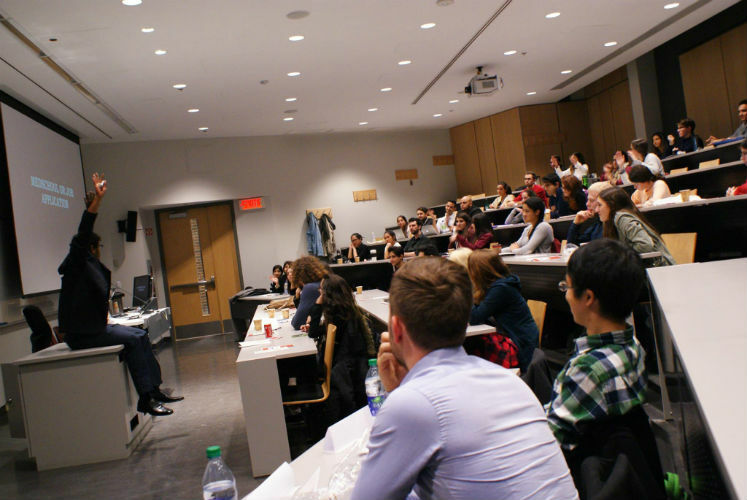 Founded in 2014, MedSpecs Concordia is the university’s first and only pre-medical club. The group is dedicated to informing and supporting undergraduate students interested in pursuing a career in medicine. They help students find out more about the different careers related to medicine and ensure students take the steps necessary to achieve their goals. “We are a club that is dedicated to helping students who are interested in pursuing a career in medicine,” said Joanne May Ramil, the co-president of MedSpecs Concordia. “Concordia doesn’t have many resources for students interested in medicine, so our group has tried to fill that gap.” The MedSpecs Concordia team offers workshops and seminars to students, focusing on information relevant to the medical school application process, such as MMIs (multiple mini interviews) and the MCAT (Medical College Admission Test). MedSpecs Concordia also hosts lectures at the beginning of every school year, which feature students and other guests from medical and dentistry schools who discuss their experience in medicine and the application process. Last year, the group held their first networking event, bringing together Concordia students and different health professionals, such as doctors, nurses, pharmacists and physiotherapists. Joanne May Ramil, the co-president of MedSpecs Concordia. “It was a huge success, and we plan on organizing another one in March,” Ramil said. MedSpecs Concordia is partnered with the ICU Bridge Program, a volunteer program that allows university students to shadow healthcare professionals in intensive care units. This year, MedSpecs Concordia is also partnered with Next Step, an MCAT preparation company, which offers courses and practice exams to help students study for the MCAT. Sara Hojabri, a Montrealer studying medicine abroad at University College Cork, said her experience with the medical school application process was long and tiring. Hojabri said that to prepare for her applications, she read through pre-medical forums like Student Doctor Network and a pre-med subreddit. She also spoke to people studying medicine and those who had already been through the application process. Throughout her undergraduate degree at McGill, Hojabri occasionally used the services provided by the Science Undergraduate Society of McGill University (SUS). Similar to MedSpecs Concordia, the SUS offers assistance with the medical school application process. While she found the group to be fairly competitive, Hojabri said it was more or less useful. “[They] do raffle off MCAT classes, and I actually got one of them. It was super helpful because it ended up being half price,” she said. Ramil said Concordia students should look forward to upcoming MedSpecs Concordia events. “This year, we have a lot of fun things planned,” she said. Earlier this month, MedSpecs Concordia and the Concordia Pre-Dental Student Society hosted an event called “So You Want to Become a Doctor?” that featured lectures from two medical school students and one dentistry student who shared tips and tricks about making it in their respective fields. According to Ramil, they also discussed extracurriculars, volunteering and research. On Nov. 23, MedSpecs Concordia is offering a free first aid workshop in collaboration with First Aid Montreal. The event will take place at 6 p.m. in room CC-308 at the Loyola campus and will give a general overview of basic first aid training, covering issues like wound care as well as bone and joint injuries. In partnership with Next Step, MedSpecs Concordia will be raffling off an MCAT preparatory bundle, which will include a preparation course and a set of practice exams. Tickets for the raffle will be sold cash-only during the first-aid workshop for $2 per entry, $5 for 10 entries and $10 for 20 entries. Next semester, Ramil said MedSpecs Concordia will be hosting an MMI workshop, where students will be able to participate in a variety of interview simulations. For more information about their upcoming events, check out MedSpecs Concordia’s Facebook page or medspecs.concordia.ca.